C-ROADS is a free, award-winning computer simulator that helps people understand the long-term climate impacts of actions that reduce greenhouse gas emissions. You can use it to rapidly test strategies for tackling climate change. Suitable for most, C-ROADS World Climate is designed for simple climate policy tests, interactive presentations, and our role-play exercise—the World Climate Simulation. It offers global, 3-region, and 6-region modes in order to test national and regional emission reduction policies. Includes French, Spanish, Chinese, German, and Turkish language support. C-ROADS World Climate is available for download to Windows and Mac, and runs online. Designed for technical users looking to analyze specific greenhouse gas emission reduction policies in various forms for up to 15 regions simultaneously. This is the only version of C-ROADS that was available prior to October 2016 and continues to be maintained for technically-oriented policy analysts. Available for download to Windows and Mac. Download C-ROADS Pro. Offers ability to quickly run real-time policy analysis on a laptop or desktop computer, unlike most climate models. Outputs are consistent with the larger, more disaggregated models used in the IPCC’s AR5. Since 2008, C-ROADS has helped the world to understand the impact of the emission reduction pledges countries have proposed to the United Nations. These proposals take different forms, with different reference years, reference scenarios, target years, and types of proposals. However, using C-ROADS we can rapidly test these policies and determine whether collectively they are enough to stabilize temperature below 2°C. More complex integrated assessment climate models also have this ability, however, such models can be slow to run and are inaccessible to everyday people. 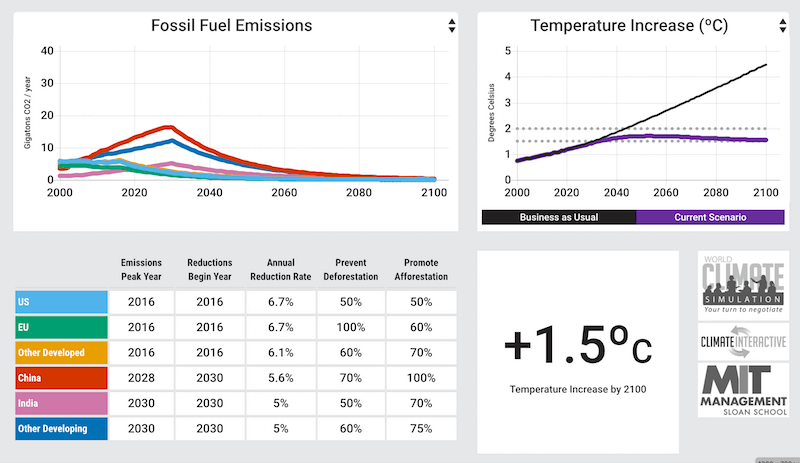 Learn more about the assessments Climate Interactive and MIT have released around the UN climate negotiations and the nationally determined contributions. To make insights about what it takes to address climate change even more accessible to people, we encourage you to use C-ROADS as part of a World Climate Simulation, where a group of people play the roles of UN climate negotiators working to create an agreement to limit global warming. C-ROADS was developed by a team from Climate Interactive, MIT, Ventana Systems, UML Climate Change Initiative, and Todd Fincannon. The name C-ROADS stands for “Climate Rapid Overview and Decision Support” simulator. The model was reviewed by an external scientific review committee, chaired by Sir Robert Watson, former Chair of the Intergovernmental Panel on Climate Change (IPCC). The reviewers recommended C-ROADS for widespread use. Read a summary of their review here. In 2013 C-ROADS was awarded the System Dynamics Society Award for the best “Real World” Application of System Dynamics. C-ROADS is being used at top government, corporate, and NGO levels, and by individuals participating in or monitoring the UNFCCC negotiations. Read comments by some of our users at the US State Department and European Environment Agency. In addition to C-ROADS we have developed several simulations that use the same scientifically reviewed model behind C-ROADS but are in forms that are oriented towards education or focus on particular results that C-ROADS gives us. C-Learn, a learning-oriented, three-region version of C-ROADS, was developed in 2008 and was available online until March 2017. C-ROADS World Climate now supports the same uses. Climate Momentum Simulation is designed to quickly show the dramatic effects that changing CO2 emissions can have on our planet. Climate Pathways is an app for iPhones, iPads, and iPods that allows users to guess the emissions trajectories needed to limit global warming to 1.5 or 2 degrees C.
World Climate is a role-playing game designed for groups of all sizes to experience the dynamics that negotiators face at the UN climate negotiations in coming up with a global climate treaty. Sterman, John, Thomas Fiddaman, Travis Franck, Andrew Jones, Stephanie McCauley, Philip Rice, Elizabeth Sawin, Lori Siegel. (2013) Management Flight Simulators to Support Climate Negotiations. Environmental Modelling and Software.